Janice Horton - author of romantic adventure novels: Writing Update - and I’d really love your input …. Writing Update - and I’d really love your input …. While I’m on the Caribbean island of Utila, I’m writing and researching a new romantic adventure novel set in the Caribbean. I’ve been asked to provide a short synopsis of the novel by the end of this month to the lovely publicist who is organising it’s launch tour later this year. 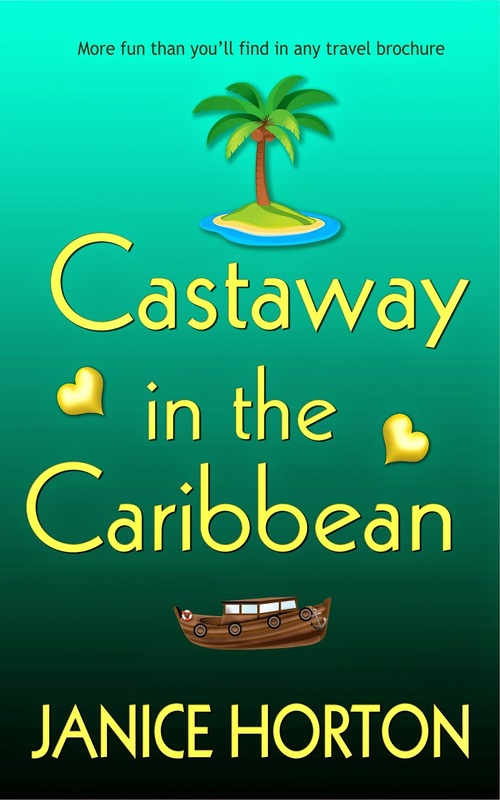 I’m only on chapter three so far with this novel but I’ve already had to work in advance and decide on a title - ‘Castaway in the Caribbean’ - and have the cover designed. I do love this cover...! A ‘short synopsis’ is the story description ‘blurb’ you’d expect to read on the back cover of the book. It’s meant to entice you into wanting to read and buy the book and tell you what it’s all about without actually giving away any spoilers or telling you how the story ends. All writers know how hard this is to do – especially for a book that’s not finished yet. So I’ve had a bash at writing one but before I email it off – if you are a reader or a writer I’d really appreciate your opinion and input. Question: Do you think my ‘story blurb synopsis’ for Castaway in the Caribbean ticks all the right boxes or do you have anything to suggest from the outline below that I might do differently? It sound good to me, janice - but then I've never written one myself. I imagine there are will be someone more expert who can advise. Thank you for your kind comment of approval Wendy! I find it so hard to write an effective synopsis. I mean, how do you relate what happens through a whole book in just a few sentences? Then there is the technical aspect - should I have used 'holiday' instead of 'vacation' for example? Oooh Barb - thank you so much and I do like - a modern day African Queen - yay! I already want to read it! Hi. Hope you are enjoying yourself. Love the story line. :) Will drop you an email tomorrow if I may on this as about to go to bed. Exhausted after RNA con. Love it! Waiting anxiously for it to come out, now that I've read the blurb and seen the cover. Feeling like I wanna be a castaway too! Can't wait to see it up on Amazon - back to work for you, lady! Really like the second version Janice. Happy writing and I look forward to reading it when it comes out. Just seen this and I really like the second version, Janice, as it's sharper and introduces the female character first. Soundsgreat! Thanks everyone for your advice and encouragement. I'm thrilled with the response. That's what I call Team Work! I just read your email Patricia and think you are spot on with your idea of splitting the 3rd para in to two sentences and getting rid of the 'but'. Thank you! I'm going to send the final blurb synopsis off to Charlotte, my lovely publicist, right now. That sounds great Janice! I'm sure time on Utila will give you plenty of inspiration. I'll look forward to checking out the novel when it's ready!